The Trough is a containment device designed to help contain waste water from the operator side of cleaning heat exchangers, U-Tube bundles, and fin fans, all while allowing the operator complete visibility and unrestricted access to the equipment he/she is cleaning. This device has a reinforced base so don't worry about using it on grating. 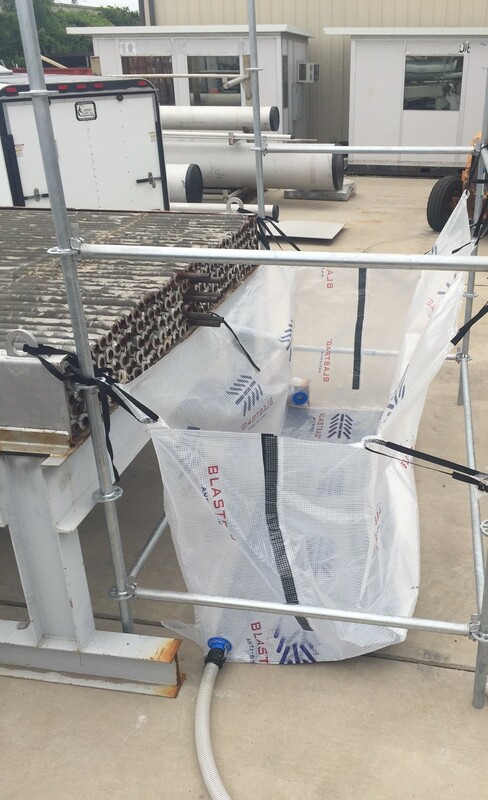 The Trough is typically supported by scaffolding, however railing and nearby structures can be used as well. Each Trough comes with 2 each 2" NPT glands to drain effluent out of the bottom. In order to size a trough, you will need to know the outside diameter of the exchanger shell flange, or the length of the header of the fin fan. Add 3' to this number and find the nearest standard size. ©2010 The Blast Bag Company, Inc. THE BLAST BAG and BLASTBAG are registered trademarks owned by The Blast Bag Company, Inc.